Design and lead an in-class writing exercise for their classmates and teacher that is inspired by a technique or aspect of that poem. One group chose Fatimah Asghar’s poem “Kul” from Issue 14, read the poem aloud, and noted that it was based on one word that could mean several, potentially opposite things – a contronym. The students had generated a list of contronyms in advance and projected them on the board (e.g., “sanction,” “oversight,” and “left”). They then invited their classmates to write at least a few lines of a poem that would, in their words, embrace these opposite meanings. 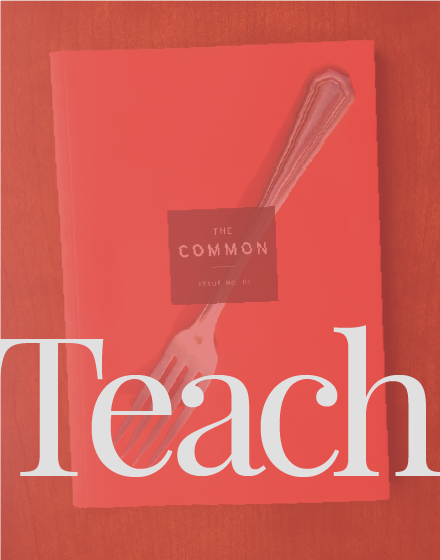 Assignment: Report on Issues 9 & 10 of The Common; select and discuss various, particular elements of the literary journal. 7 pages (2,100 words) minimum. Discussion should lead to two results. 1. Analysis and clarification of the material. What is the author saying? What is the author’s intended effects of key words in the text? What do you see as the theme of this story, poem, or play? What elements contribute to this theme? 2. Response to, and criticism of, the author’s work. What do you think of the author’s techniques? Is the author’s argument about poetics well reasoned and convincing? How does this poem make you feel? Why? What connections (harmonies or conflicts) do you find between this author’s ideas and those of others we have studied?